I am a stay-at-home mom who prefers to wear yoga pants, a sports bra (or no bra), and a cotton shirt most days. But, that doesn’t mean I can’t step it up a notch to be in-style and on-trend when I want to. 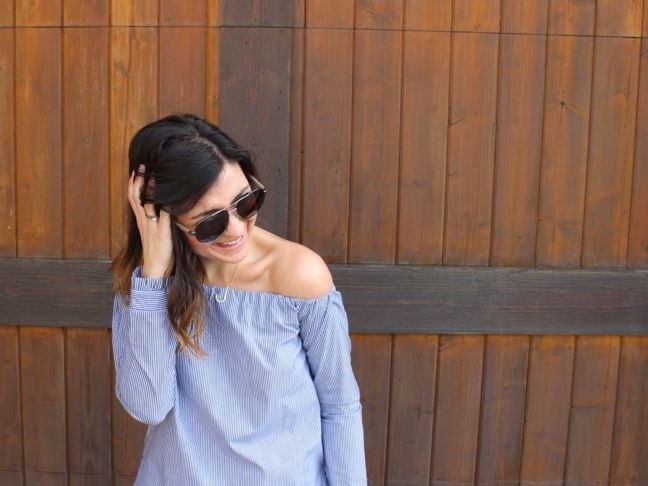 And a trend that I love that’s still (thankfully) happening: the off-the-shoulder top. 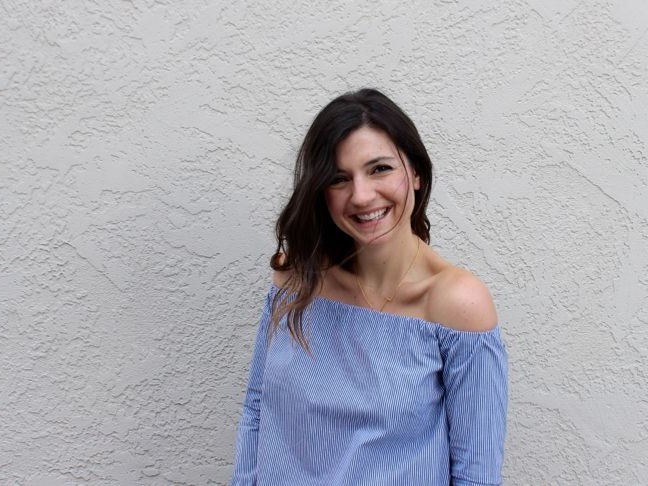 I shopped my closet and decided to upcycle a high-neck shirt that hasn’t seen the light of day in years. 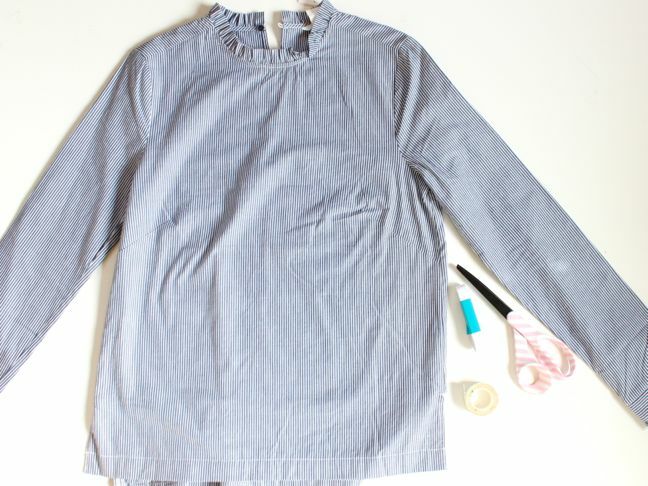 Since I don’t know how to sew (as I’ve mentioned), I found a way to make this DIY off-the-shoulder top in less than 30 minutes without a needle and thread. The result: an on-trend look that didn’t bust my budget. 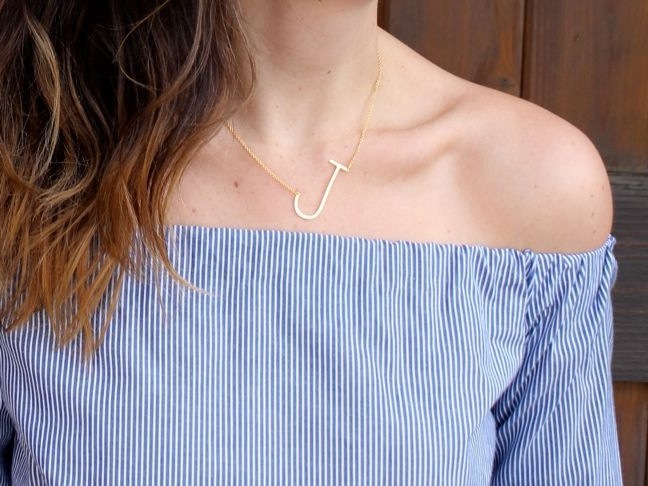 Follow the instructions below to make your own DIY off-the-shoulder top. Have fun! Step 1: Lay the shirt out on a flat surface. Mark a straight line with a ruler from shoulder to shoulder, or eyeball it (as long as you have a good eye for a straight line). 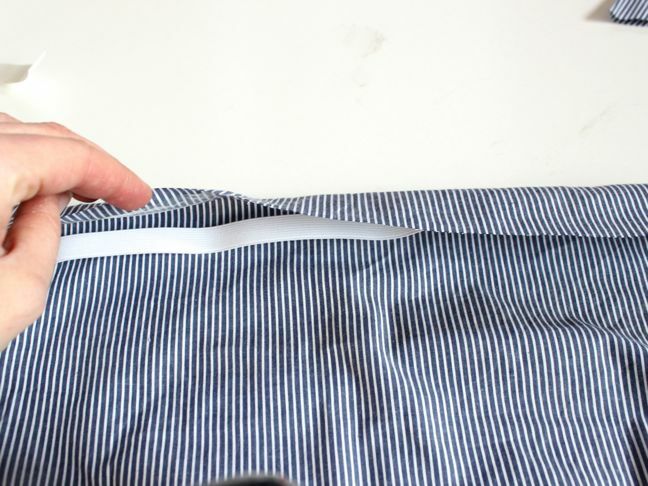 To be even more precise, try the shirt on first, make pencil marks so you know how low you want the shirt to fall, and then follow those marks when you are ready to cut. 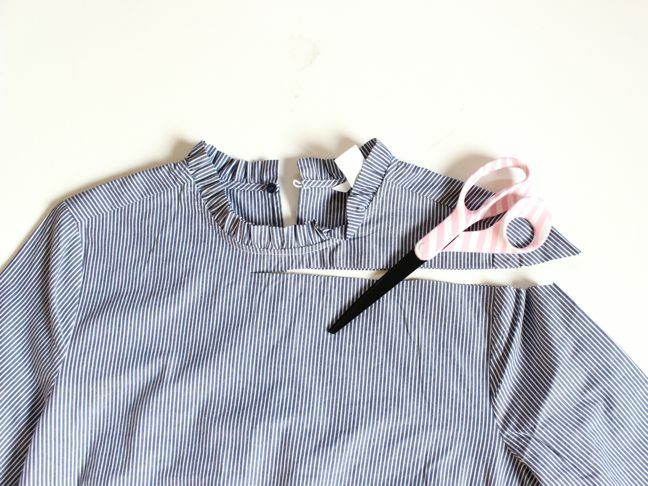 Step 2: Cut the shirt in a straight line from shoulder to shoulder. 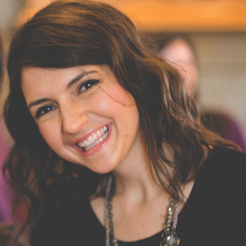 Keep in mind the final length will fall about 1 inch lower than where you cut it. 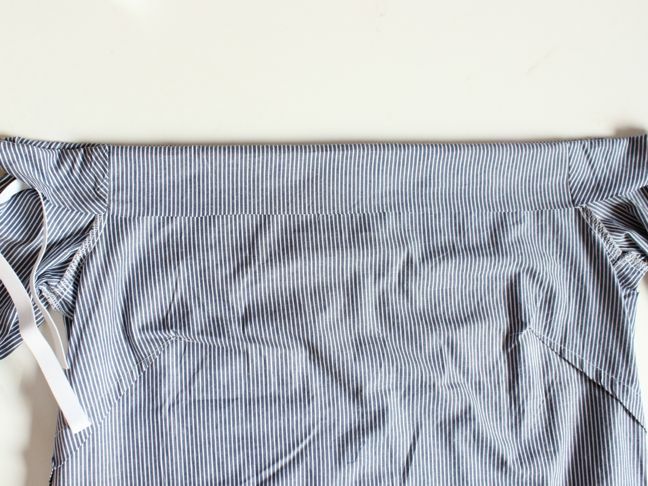 Step 3: Turn the shirt inside-out, and set the elastic about 1-inch under the top of the shirt. 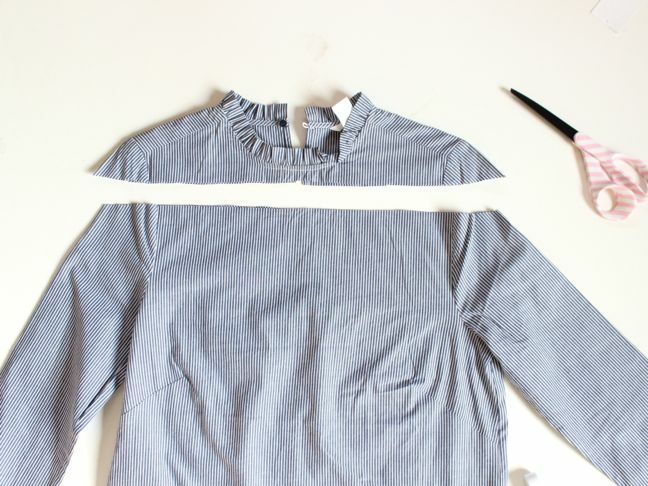 Step 4: Cut the tape the length of the shirt. 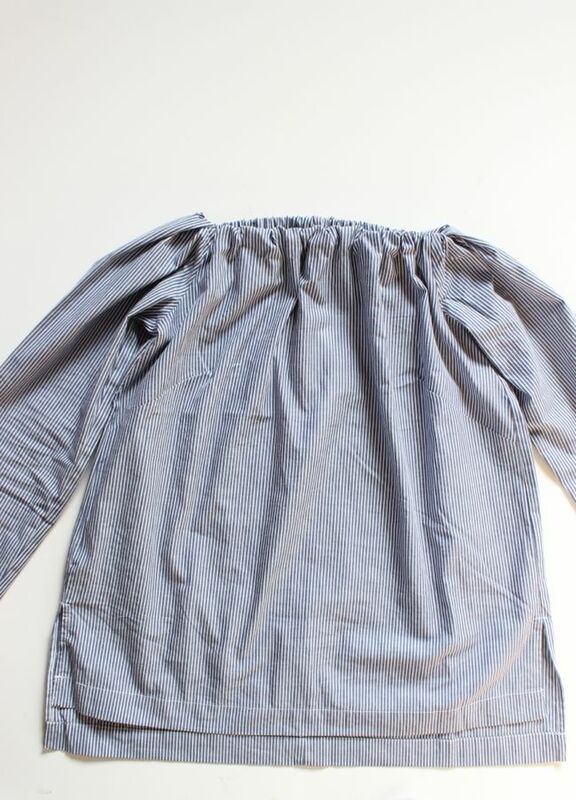 Press the tape along the top seam, pull the paper backing off, and then fold the shirt over the elastic. Flip the shirt over to the back, and repeat this process. Leave a small space without the tape, so you can pull the elastic tight and tie a knot (I left my open space on the far left, which you can see in the photo). Do not tie the knots yet. 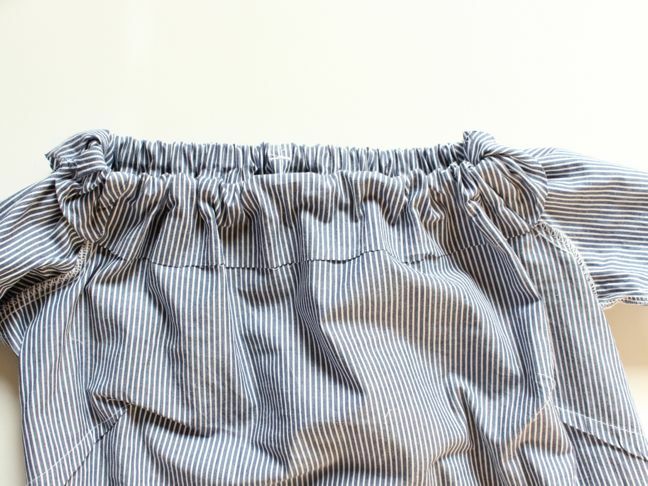 Step 5: Once you have the seams folded over, return the shirt back to normal (so it’s no longer inside-out). Try the shirt on, carefully holding the elastic strings. Grab the two elastic strings and pull it together. Make sure it’s tight enough so the shirt stays comfortably on your shoulders and upper chest. Tie the elastic into a triple knot. 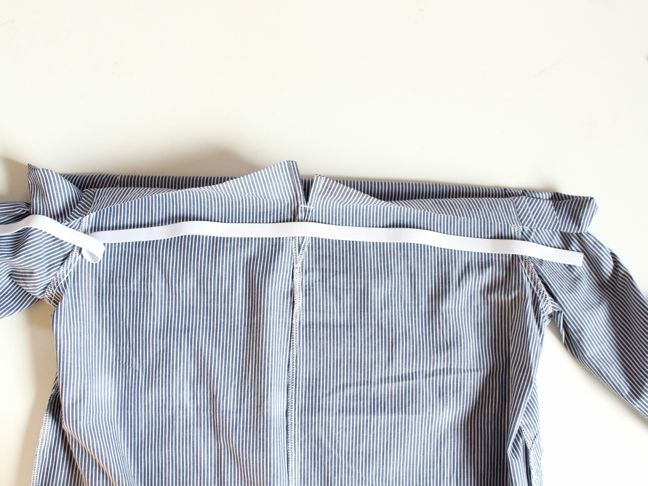 Step 6: Take the shirt off again to trim the excess elastic from the knot. 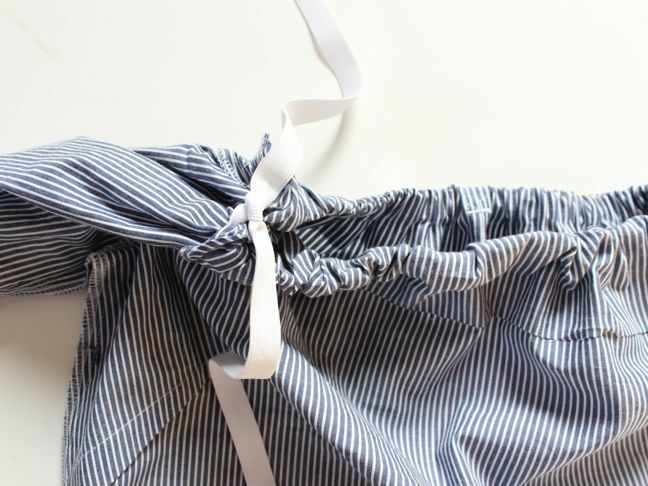 Add tape to the small part of the shirt you left open to tie the elastic in knot, and fold the fabric over the knot so that it is not visible. Step 7: Wear it and rock it!